The Hexacopter’s features go far beyond the basic manual control RC multicopters on the market today. Unlike RC-only multicopters, our Hexacopter is a complete UAV solution, offering both remote control and autonomous flight via GPS, including waypoints, mission planning and telemetry displayed on a powerful ground station that integrates with Google Maps. In the next week or so, we will be putting it though it’s paces. At its most basic level, play fosters creativity and imagination and connects pleasurable emotions to learning. This is what ‘back to basics’ should be all about. Play with your students. Get down on their level. Learn with them. Construct 2 is a relatively new HTML5 game making tool. Currently available only on PC, this powerful engine allows you to make Chrome store & Facebook Games, with zero game making or programming experience. There are lots of tutorials available, but if you are the type that feels that they need a bit more direction than you can currently take a Construct 2 course on Udemy for $149. Catch a short demo of Construct 2 by the Scirra team. Failure is a concept that we are all familiar with. In school you likely passed or failed. You made the basketball or football team or you didn’t. And if you did fail, perhaps your parent or guardian was there to tell you, “don’t worry about it, we will try harder next time and you will succeed, mark my words.” Except in rare circumstances where a students intrinsic motivation, life at home and belief in oneself is in perfect harmony, the most likely result from students failing at something is that they will expect to perform similarly on similar tasks in the future. Failure engenders a feeling of incompetence or helplessness in most people. In Perceiving the Causes of Success or Failure, Weiner states that when one thinks of success or failure, the four factors that come to mind are effort, ability, luck and difficulty. The first two factors, effort and ability are features of the student, whilst the last two are external. When the emphasis is on how students are performing, like it is in most schools, the perception of static intelligence is perpetrated throughout the community, usually during conversations between parents and their children, “I was never any good at math,” which in turn becomes a vicious cycle of self-fulfilling prophecy which alienates children from the subject area that their parents were no good at. This mindset is the ability mindset, and hints at the fact that no matter how much effort one puts in, they are just not that intelligent when it comes to mathematical thinking. As an aside, this is my main problem with gamification – the adding of an extrinsic layer is at odds with what makes a learning activity or a game good in the first place. What typically motivates a student/player to gain mastery over a game and spend a great deal of time with it is intrinsic. The reward mechanic of a game or learning activity (leveling up, unlocking an ability or item) is only a small part of what makes it successful. By adding a rewards layar to something in the classroom (badges, experience points – Lee Sheldon, The Mutiplayer Classroom), sometimes the focus then becomes the reward, to the detriment of what you were trying to achieve initially – mastery over content. In a ‘Gamified’ classroom, how many students are just brushing over content superficially in order to ‘level up’ as quickly as possible? Gamification assumes that a player/student isn’t especially motivated to begin with, and then provides incentives to ramp up that motivation – with games it is the opposite – students are motivated to begin with and it is the design of the game that provides motivation, namely that students are always within their zone of proximal development. A consequence of this is that gamification than has the potential to glamorize a poorly designed curriculum, or curriculum that may have been no good to begin with. The argument or comparison about failure in games and schools is something I have been struggling with. At it’s most basic level it seems too simplistic. Failure is discouraged at school – in school, typically the process is that students would hand in an essay, project etc. for the teacher to grade. This assessment is summative and depending on the circumstance, one could argue that the student learns very little about the process, irrespective of the depth of feedback obtained from their teacher. The student either fails or they pass. And then they move onto the next topic. Whereas with well-designed games, a culture of informal formative assessment is present, where failure is a form of progression rather than being a sorting mechanism, and the feedback gained in real-time allows the player to adapt and overcome any and all obstacles in front of them. 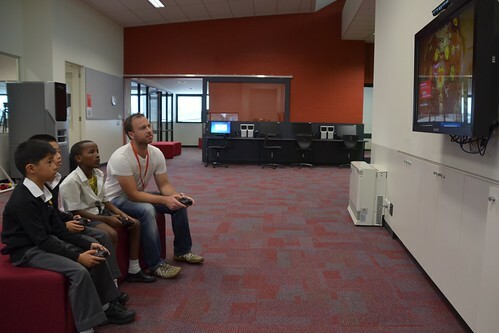 James Paul Gee often talks about video games creating a psychosocial moratorium – that is a learning space in which the learner can take risks where real-world consequences are lowered. The cost of failure in these environments is not prohibitive, as it is so often in schools. As Gee is one of the definitive scholars in using games for learning, most cite his work and say that school should then be more like a game. And this is where I have difficulty. Think of the most complicated game that has levelling mechanics, maybe World of Warcraft, maybe Skyrim, and apply this process of failure as a form of progression. A player grinds toward the next level up, often fails, but then gains mastery or unlocks a new skill such as the ability to cast a new spell. Relating this to the current state of education; the grind is the process of gaining mastery, whilst the level-up is the point in which one can fluently wield the destructive powers of say, Calculus.